Although I’ve been an abstract mixed media artist for years, for most of my life I had both the fear of drawing as well as the desire to learn to draw. 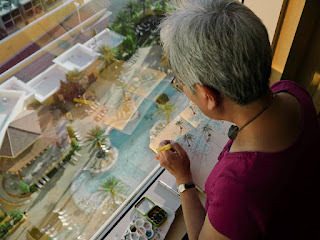 In September 2011, partly because of that desire, and partly because I was so inspired by Gabi’s Seattle Sketcher column, I finally decided to overcome the fear. His drawings of Seattle – my birthplace and lifelong home – were sights that I had seen many times, yet had never truly seen. I wanted to learn to see, and therefore experience, those locations (and any new ones that I travel to) more thoroughly. 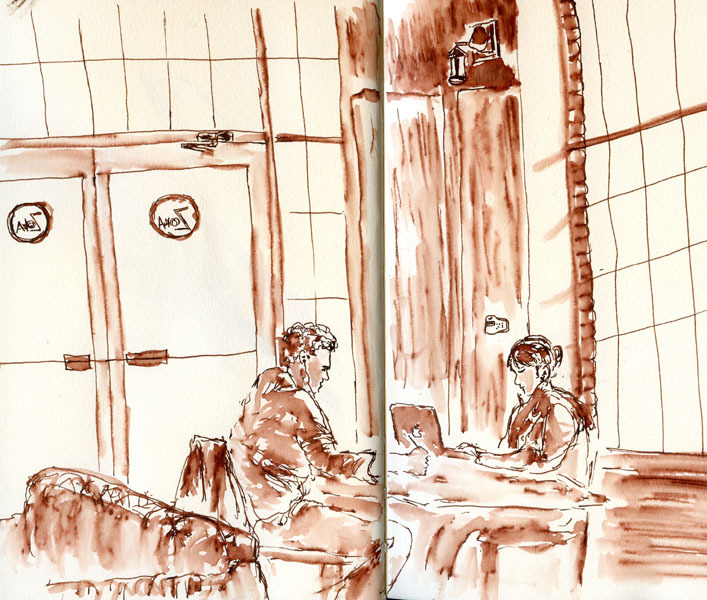 Part 8 of the Urban Sketchers Manifesto, to “show the world, one drawing at a time,” has a flip side: Sketching enables me to see my world, one drawing at a time. I enjoy sketching a variety of subjects, but my favorite is people in their environment. (My current sketching bugaboo: cars. I’m working on it, though.) Last summer I went to as many neighborhood farmers markets as I could. Buskers and other musicians became my favorite sketching “victims” because they stay in the same spot for a while. 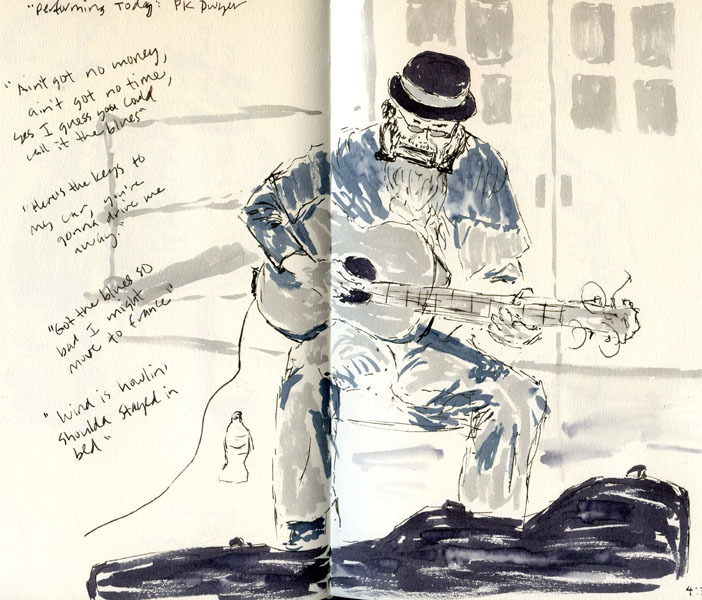 The sketch above is of blues singer and guitar/harmonica player P. K. Dwyer performing at the Phinney Farmers Market in August. Some of his songs were about his experiences as a busker while living in New York subway stations. As far as I could tell, all the tunes he performed were original. 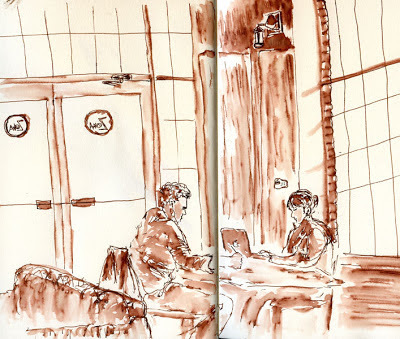 The second sketch is an example of how I spend all the many cold, wet sketching months: in coffee shops. With tall ceilings and lots of natural light coming through large windows, Zoka Coffee and Tea near Green Lake is my favorite. This sketch is also an example of my current favorite sketching medium/technique: water-soluble fountain pen ink washed with a waterbrush. When I attended my first sketchcrawl in May 2012 at Magnuson Park, I had so much fun and found everyone to be so friendly that I was encouraged to keep on attending. I’m thrilled to be a Seattle USK correspondent! Please visit my blog, Fueled by Clouds and Coffee.